Visible Learning…at last! originally published on Hamford Primary School’s Teaching and Learning Blog. My fundamental task is to evaluate the effect of my teaching on students’ learning and achievement. The success and failure of my students’ learning is about what I do or don’t do. I am a change agent. I want to talk more about learning than teaching. Assessment is about my impact. I teach through dialogue not monologue. I enjoy the challenge and never retreat to “doing my best”. It’s my role to develop positive relationships in class and staffrooms. I inform all about the language of learning. 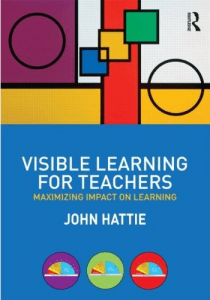 To find out more about the influential work of John Hattie visit our Visible Learning page. Categories: AfL, Assessment, CPD, Inspiration, Learning | Tags: Collaborative Professional Development, CPD, Education, John Hattie, learning, pedagogy, visible learning | Permalink.